"Expelled", or "Driven out"? suggests a forceful, active, removal, but hopefully not a brutal/terminal one? Phew ... hay fever time. After these sunny days hazel nut et cetera start to bloom as if there was no tomorrow - so much I needed to take a Cetirizine - once done I know that the followup hours are "sleepy" and kind of "boozed" (which is why I won't take such stuff during serious work days). Back to ontopic - got half an evening now to do something (after getting exhausted today by the kids - and the medicine). Had a short peek during lunch break today and somehow ... on my windows laptop the ships slightly "flickered". Dunno if it was the laptop driver or the SDL opengl-BlitzMax NG connection. I then added a "DrawRect(lastRenderedX,lastRenderedY,1,1)" with a gray color before I drew a rect of the same size, (almost) same position but the player color - and the flickering was a bit less visible. After rendering I updated "lastRenderedX/Y" to the current position. A bit like a "ghost effect" (but not always visible - as I updated positions during rendering, not during update/logic/physics). Also I was of the opinion to see the "1,1 scaled to 2,2"pixels to look a bit squashed from time to time - as if the scale/rotate/... matrix is borked up. So I disabled scaling and let it play in glorious 320x200 - and it still kind of flickered. If I "paused" the game (ships do not move) then no flickering was visible at all. All ships only render at integer positions and the flickering seems not to be based on "x/y varieties" but as if the colors "flickered" a bit. VSync was on. Rendering the ships with "w=2,h=2" instead of "1x1" and there is also no flickering visible - so its the "movement" which creates the effect. Now I am back on my home computer and closely looked on the screen: it did not flicker. And yes I use delta timing etc. - and both computers are capable of maintaining the constant update/physics rates. The laptop uses odd 58 hertz refresh rates - dunno if that "cheats my eyes"? I created screenshots and the image was crisp and the colors correct. So why do I write the above? Such kind of "flickering" could create headaches/feeling of dizziness - which I do not want you/my fellow coders to experience. I dunno if I should add an option to the game which allows some "anti alias". If that was checked then I would draw a "alpha = 0.2 or so rectangle at the old position" or draw it at float-coordinates so that the movement isn't that "flickerish". Did not try yet so maybe it doesn't even help. And as said: on my linux box it does not happen --- oh, now that I've typed this post it came to my mind that I could boot up linux on that intel/windows laptop to check if it is the display (for whatever reason). Will do once the kids are in bed. Think it might be an issue with the laptop itself - booted Linux and it has shown very similar issues while it run at a display refresh rate of 60Hz. When I moved the application Window of the titlescreen I saw the stars ("burned" into the title screen image) to vanish while moving - as if some algorithm is trying to "cache" content. Also the rocket "smudged" while doing so. As soon as I stopped dragging the window around all returned to behave as it should. It used a 40Hz refresh rate (?!) and kept having this issue when going to a 60Hz refresh rate. Ok ... thought about replicating it while moving a chrome window around - and guess what, grayish "thin" fonts were hidden during drag-around too. So I guess it is either a Windows issue - or something specific to this laptop. As a screen cap does not show that issue I assume it is a Windows-Laptop-combination-thingy not worth to repair for now. Time is running out already. Had less sparetime than thought - but at least finished a more or less "complete" statistics screen which for now is displayed after you won/lost. Maybe I just add an extra "button" or icon somewhere on the screen so you can have a look during play. 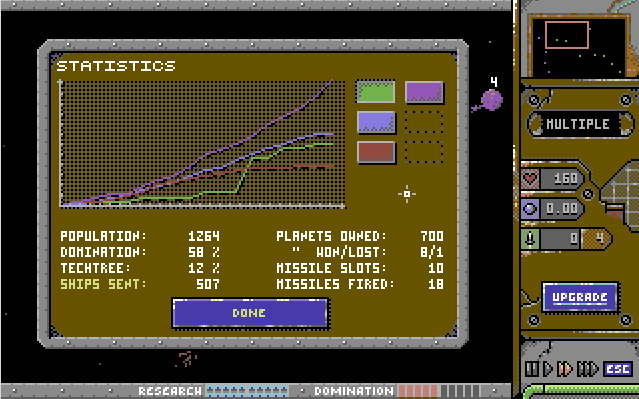 I love that statistics screen. Great work !! It is only there to satisfy the desires of statistic junkies. I know there are players around who want to see such stuff ... and others who skip this stuff for sure. 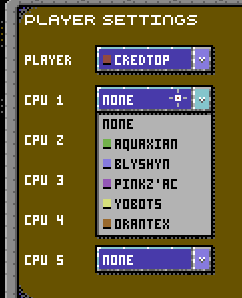 Finished writing some GUI widget stuff and painted widget sprites. 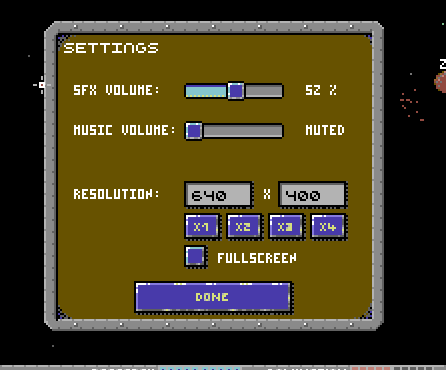 Settings screen (sound + graphics) done now - including effects (so setting the resolution changes stuff accordingly). Lot of trial and error to position stuff the way I could accept it ... and then, 2 hours gone already (wife enjoys watching True Detective now so my place is on the couch not on the computer). Hope to find some time tomorrow to create the skirmish/mission screen + Loading/saving boxes. Gui-stuff is interactive. There could of course be a lot of more stuff configured here and there - but I doubt anyone will really use it the next time. The letter N is ... a bit hard in 3x5 pixels ;-) Especially if "M" and "H already just differ in the position of the vertical "1px bar". You're amazing Derron. That's so much work. Fixed that TTF and licence is "100% free" so I am not sure if I was allowed to provide a "fixed" font file or better render everything as bitmap(font). Page created in 0.147 seconds with 22 queries.